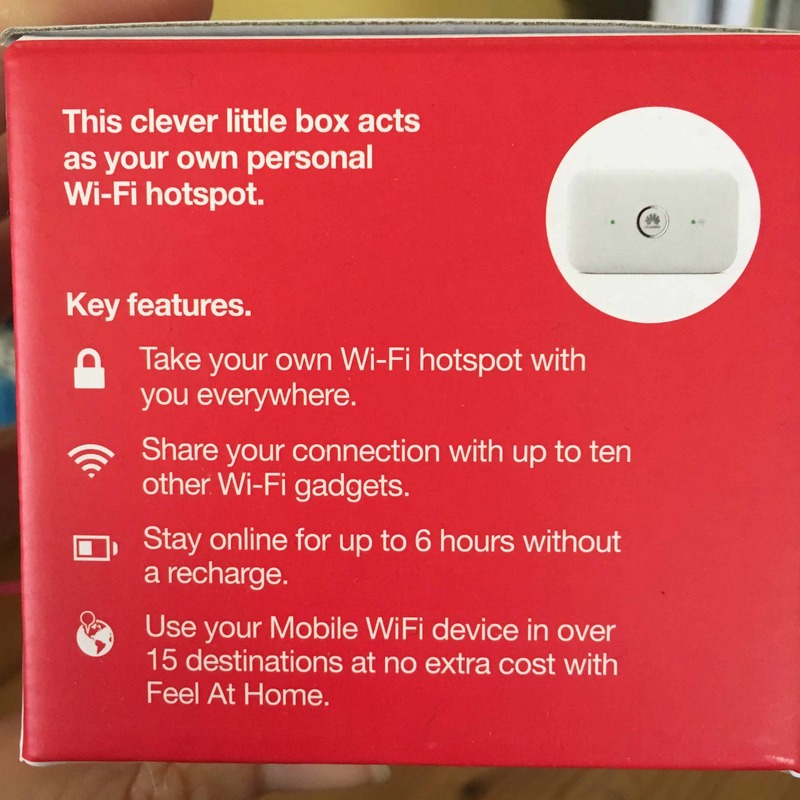 I’ve always fancied the idea of a MiFi device. I don’t travel a lot with my business, but I do spend a lot of time out of the house waiting for the children to do this and that, and it’s handy to use that time catching up on social media and similar (it’s necessary for work – really…). Some places I wait, have great Wifi connections and others not so great, so I do find myself pulling a lot of phone data each month. The only thing that put me off trying a Mifi was the fact that you have to have a contract. What if it wasn’t the big business lifesaver and enabler that I thought it might be? Then it would just be an additional expense that I could really do without. The first thing that amazed me was how tiny it was – about half of the size of my phone and maybe a quarter of the weight. I am a bit of a gadget nerd, but I think it’s beautiful – so simple. The only downside is its ability to easily get lost in the bottom of my handbag and briefcase, but that is my failing not a design fault. I was going to write a great long tutorial as to how to set such a thing up, but really there is no need. I installed the battery and the Sim – easy enough if you have ever used a mobile phone, charged the device and switched it on. There is only one button – you really can’t go wrong. There was a green light for both battery strength and signal strength so I searched for the Wifi signal on my iPhone, input the password and voila! I was online. And so began a month of travels with my Mifi. 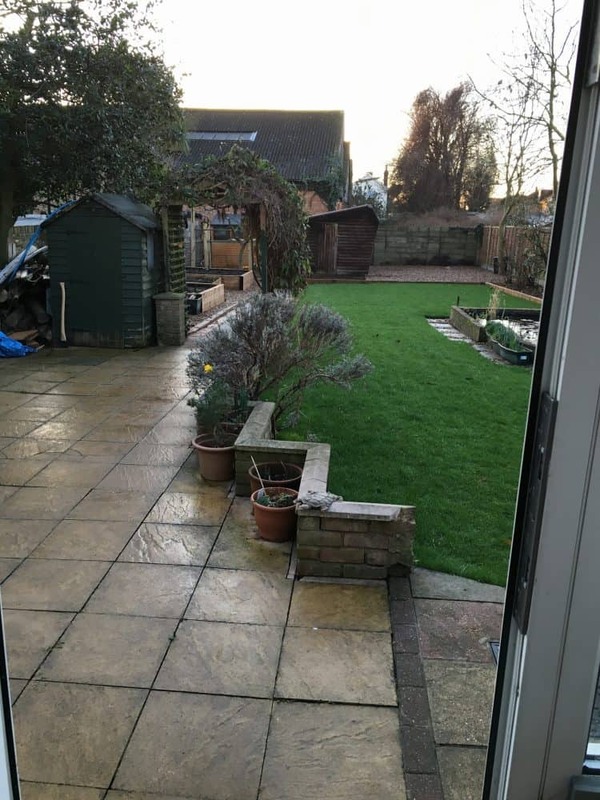 My month of testing coincided with the Easter holidays so I wasn’t working as hard as I sometimes do – but it also coincided with the beginning of the warmer weather, tempting me to try working outside now and again. One of the first wonderful discoveries I made is that of course I now have a Wifi signal down at the bottom of my garden. 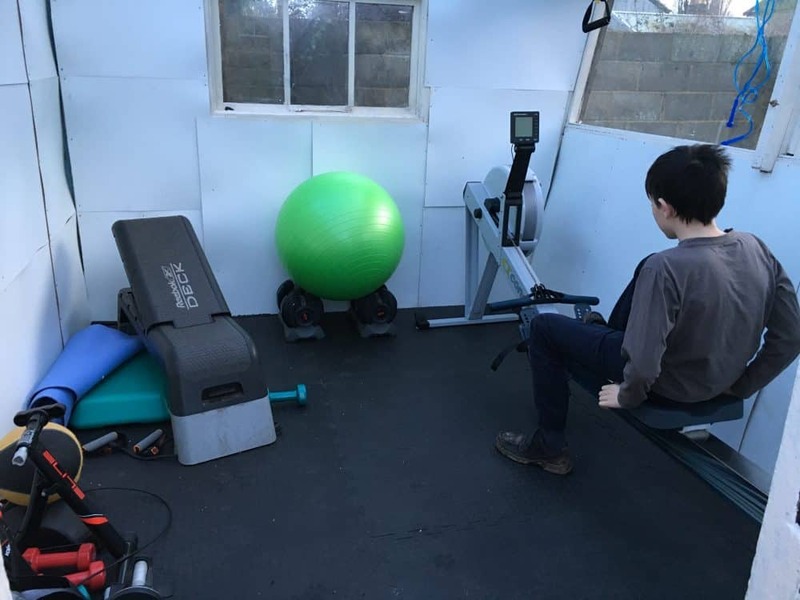 I have a lovely table and chairs set out there which I could use for working and I can also get exercise videos and Spotify playlists in our home gym in a shed. I took the Mifi out with me when I walked the dogs in the park. It’s a bit cold yet, but in summer I could really see myself bringing my tablet to the park and setting up to ‘work’ under a tree on a blanket while the dogs have fun outside. Then I took it when I went up to my choir rehearsals and a couple of concerts. 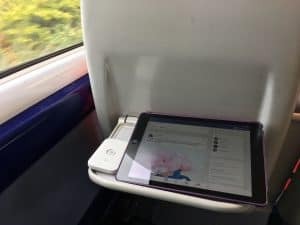 It was great to be able to use the time on the train, for some of my less demanding work, and to keep on going while sitting in coffee shops and waiting in churches – which is the lot of every busy chorister. The battery life is about 5 hours, but it can be extended if you take a charger with you or find somewhere to plug it in. And finally we had our real family holiday in our holiday cottage in Mudeford. 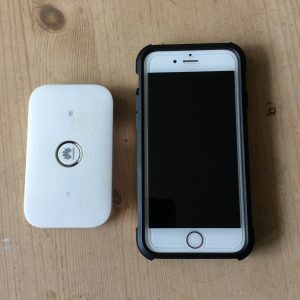 They do offer Wifi in the holiday homes there (at a cost), but the real benefit to me of having the Mifi device was that I was able to ration the Wifi, turning it on and off as I saw fit, so that my teenagers did come off their devices more than once and venture out into the sunlight. I sent them off to the pool, then turned the WiFi back on again and got to work (on the patio). On this trip though, I did hit upon a snag of sharing my Wifi with my family. I asked the teens nicely not to spend time watching videos while we were away, as the Sim card I had was limited, and we would have to top up if we ran out of juice. My daughter understood me perfectly; my son wanted to be good – he didn’t watch a single YouTube video but instead spent his time online gaming…… result we burned through my internet allowance in double quick time. 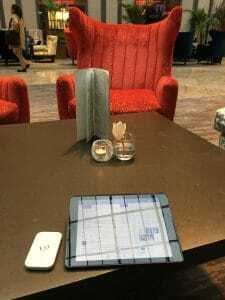 Yet more travels with my coffee…. And so my month is over, and I really don’t want to say goodbye….. The Three UK MiFi has definitely made my life better in all kinds of ways. Admittedly a lot of the improvements were in my personal life. I’m not sure if I can say hand on heart that my business has been made more efficient due to this. But honestly, I have to say that this is a purchase I will definitely consider in the next few months. I will do some research now as to contracts and data pricing with the different networks, but if the prices are similar I would definitely consider using ThreeUK. 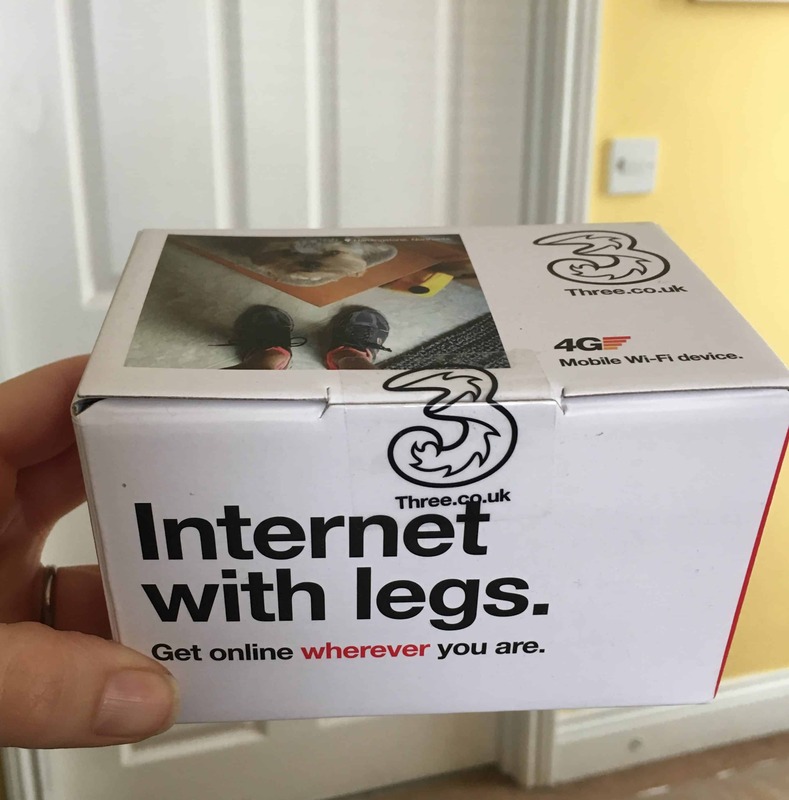 The speed of service is excellent – the product arrived almost immediately, well packaged and with everything I needed to get started – and the coverage of the Three 4G network substantially increased the places where I could use my phone (which is on a competitor’s network and has substantially worse coverage than the MiFi did). I really don’t want to give this little beastie back – over the last month I have grown really attached to it, and I feel really sad at putting it back in the brown envelope and sending it away. So maybe I need to spend less time in coffee shops and buy less cake, so that I can afford to spend more time working outdoors this summer.